Will People +1 Google+ against Liking Facebook? Google has launched Google+, currently by invitation only, to make its presence in the Social networking space. Facebook, which has been spreading its tentacles, to every nook & corner of web, is posing a big challenge to Google. Google has come out with Buzz, Wave & others to pose a challenge to social sites. However, none of them have been successful so far & Google+ is the latest by Google for the social space. Google+ features Circles, where you can organize by family, friends & others. The UI of Plus is very different from other Google sites & recently Google launched What do you love website (www.wdyl.com) with a different UI. Google’s +1 has been available for websites for sometime now & it is also showing up in search results for top sites. Facebook has the first mover advantage in the social networking & will users +1 google+. Why should Brands Care about their Online Presence? The infographic gives an idea of what happens on the net in 60 seconds. From Facebook Posts to youtube videos, users are creating vast amount of content, pics, videos on the net. They are talking about the services, brands, products & others influencing their visibility. Brands should have clear online strategy to increase their online presence & interact with the customers to develop rapport. Google has decided to retire two of its services, Google health & powermeter. Google came up with these to help organize the information & make better decisions. Google health will be available till Jan 1′ 2012 & thereafter 1 year to download the information. These 2 sites failed to get the interest of the public. Powermeter will close on Sep 16, 2011. With PowerMeter, Google had hoped to raise the awarness about the energy consumption & better energy savings. Google health was introduced in 2008. Google has released voice search for desktop. Users can click on the microphone in the search box & speak the search. This voice search was first available for mobile devices & has been introduced for desktop. Google has introduced search by image feature where an image can be uploaded & google can be used to find out what it is.Google instant was released by Google earlier to render instant results. Now google instant pages are available which which prerender results when we are going to click them. With the rising income & internet access, more & more Indians are shopping online. This has led to a rapid growth of the e-shopping sites in India. Also the group buying sites have attracted more people to find deals online.Some of the sites are naaptol.com, snapdeal.com, dealsandyou.com, letsbuy.com & others. This has also resulted in more job opprtunities for ecommerce technologies. Social media is also fuelling the growth of e-shopping in India as users discuss about the reviews. Users are checking for reviews online before buying a product or service. Recent reports have also noted that rise of social media in consumer service is helping develop better rapport with customers. Facebook is close to 700 million members mark. It continuos to be the top social network establishing its leadership in many countries. 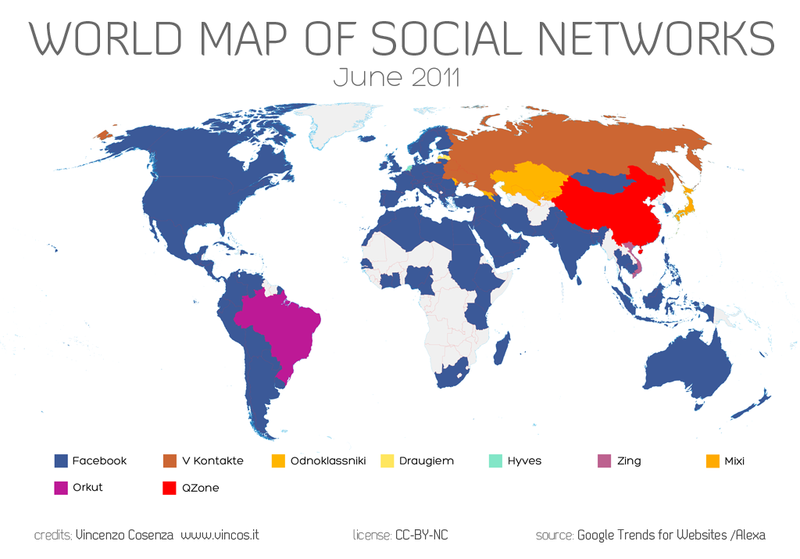 Brazil & India, where Orkut was leading, facebook is gaining popularity. Here is a chart of top social networks across the globe. There are many country specific sites which are popular in regions like Maktoob in Arab, QQ in China, Zing in vietnam & others. Twitter & Youtube are also gaining popularity & membership of twitter is also increasing.